I’m new to the world of forex trading and over the past few months have been getting my head around some of the jargon and practices within this new but exciting world. I’ve even managed to successfully write some of my own EAs in MT4, which is coming on nicely. Before embarking into the market with real money I’d like to take in as much information as possible to increase my chances of being successful. 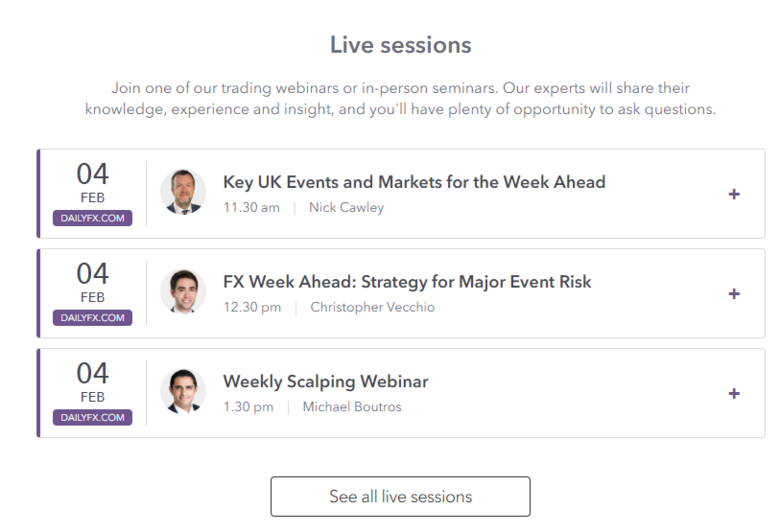 Can anyone recommend any trading seminars or talks in / around the London area? I don’t mind paying a little bit as long as there is value to be had. Obviously free would be ideal but I’m guessing at the free ones there will be lots of software/broker pushing. Any views or opinions would be gratefully received. You state you are new to forex trading so the interference I am making (could be incorrect) that you were trading another asset prior to this? Is that correct and if so which other assets and markets were you trading? If not then are you totally new to trading per se? Personally, I think you need to conduct your own research and plenty of reading before attending any talks/seminars. The reason being is that if you attend a poor seminar and they feed you a load of garbage how will you be able to determine the creditability of the rubbish being thrown at you? At the same time if you attend a talk which is exceptionally brilliant how will you assess the value and importance of this without having a solid foundation and knowledge in the area? What Forex trading books have you read to date? Why have you chosen Forex ahead of other markets such as equities, commodities, etc? A lot of traders tell me that they trade Forex ahead of other markets as it is the most liquid. They state liquidity as the key reason. Liquidity itself does not increase the chances of success or profits. 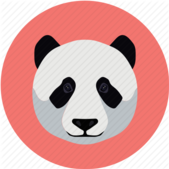 It is the trading plan, trading strategy and trading system that will determine what the chances of success and profits are. There are times when less liquidity is better when trading certain trends in commodities as you can hold the trade for longer and it is less volatile. Volatility is great for short term traders, swing traders and day traders. Scalpers love volatility. Long term traders hate too much volatility but they need to enough for the trend to really gather momentum and strength rather than sideways price action. I’m new to trading altogether and headed for forex after reading recommendations that I read online. Liquidity, volume and the ability to trade 24 hours was appealing, especially seeing as I travel a lot. I’m looking to do this in addition to my full time job but I’m fortunate that I get a lot of time off and opportunity to do other things. I’ve been trying to assimilate all the information I can from online websites and video channels but there seems to be a plethora of info and I’d like some experienced people to point me in the right direction so I don’t end up looking at the wrong material. Effectively sorting the wheat from the chaff. Can you recommend any books to read? Any online sites or video channels. I’ve been doing the tutorials from IG and have found them very useful. I’ve also watched a lot of the videos from forex signals channel on YouTube, again very useful. I’ve be on the case now for a good few months so do have some knowledge and have written my plan and strategies I even got the written down in a fancy PowerPoint presentation. I’m know at the point where I’m tweaking strategies and backtesting but before I proceed I’d like more information. I work in a very risk averse industry and I like plans and risk management is key. I like the idea of using MT4 and EAs to provide me with signals and I actually enjoy the coding side of things. I have a mathematical degree so that kind of geek interests me. If you have your trading plan and trading strategies in writing then one would assume you have done your reading and research before completing both of these? A lot of traders talk about 'backtesting' but in my personal opinion one must have some form of 'forward testing'. It does not necessarily have to be the same length of time as 'backtesting'. So for example 3 years backtesting vs 1 year forward testing. This is just an example and it really does depending on a lot of other factors including what assets you are trading and what timeframes you are going to use. IG do regular free seminars in London though none scheduled just at the moment, keep an eye on the Academy page 'Live Sessions' for seminar announcements. Thanks guys. I’ll take a look at the IG sessions. One must ask the question how effective IG's trading seminars really are? 81% of retail investors are losing money. It may simply be a case that the seminars are very good but IG's clients are not watching them. If that is the case then why not? How does one define and quantify a trading expert? For me a trading expert must be someone who has vast amounts of experience in trading and one would like to think that has been extremely profitable as otherwise how can they be of any use to IG's clients? Apparently they will share their knowledge, experience and insight. The real metric is how many trades have they completed in the last 12 months and how many were profitable and how many were not. Are they performing better than the 81% of retail customers that are losing money on IG's platform? The 81% number is a top level statistic which I don't think is actually that beneficial and really doesn't show the ins and outs of client trade activity. If you want to use statistics and data then you need to dig much deeper into the numbers and in my personal opinion people shouldn't take these headline numbers as facts without substantiating them first. I've linked to a couple of insights we do have, noticeably which show analysis of 43 million trades, to show that actually on average on a per trade basis clients are winning more than 50% of their trades. If you were to take EURUSD for example a whopping 61% of trades are actually profitable - i.e. the client is winning their trade - and on average they book 48 pips. 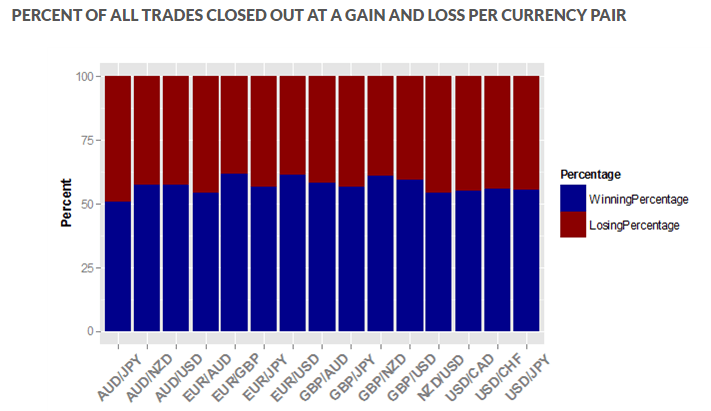 This means that only 39% of trades which clients took on EURUSD were loss making. The issue is clients on average hold their losing trades longer - in this study for about 83 pips. Each person needs to make their own trade plan, but the data is pretty sturdy. Another important point on the 43 million live trades analysis is that traders who upheld a 1 for 1 risk reward trade ratio had a better than half chance of being profitable after 12 months. Specifically 53%. Those who didn't have that 1 to 1 only had a 17% chance of being profitable after 12 months. The data therefore suggests that account profitability is wholly down to a client sticking to a trading plan over a longer period of time. Thank you for your response and further detailed explanation which I think was both very useful and interesting. What is the trading background and success of these experts? How many of their trades are profitable? How much profit / loss do they make per annum in percentage terms as they may not want to disclose revenue figures? Do they actually currently trade the markets so they understand the 'audience' they are catering too? I remember reading this report years ago and nothing changes. 1/ With a strategy that has a roughly 50% win rate (eg, coin toss) and letting your winners ride while cutting losers early you will be a successful trader. 2/ Everyone does the opposite. The psychology element is the crucial part. We ride losers because until you close the position it's still only a paper loss and may yet turn around and prove you right after all. We only give up when we can't stand the pain any longer. We take profits early because we have been proved right and the longer we stay in the more chance there is of price turning around and that will mean being proved wrong and that must be avoided at any cost. We think the most important part of trading is making a call and then being proved right. This way of thinking is completely wrong. good questions, however I do not have this information. ﻿ We take profits early because we have been proved right and the longer we stay in the more chance there is of price turning around and that will mean being proved wrong and that must be avoided at any cost. Good post caseynotes, and i think these two are very useful points to bring up again. You hear it all the time and i think it's something people brush over without really thinking about how important it is. "No one knows which way the market is going to go." That includes many hedge fund managers, retail investors, and those who are looking to simply flip a coin. We try and do work and research to help us understand it a little more and help our predictions, but at the end of the day there are a myriad of different factors which many people don't get to wrap their heads around. Just look at Woodford who had a few great years back to back and then a few terrible ones. Not just Woodford, also thinking more recently of Bill Gross the one time 'Bond King', retired in the last few days. With all their expertise and supporting resources they still can't keep on top of it. Markets are constantly changing with new data and evolving cycles. Trying to second guess the future doesn't work. What is needed is a set of rules (a process) that will automatically trigger a trade, then a second process for managing the trade and then a third process for exiting. Taking the guess work and emotion out of the decision making actually makes things simpler, clearer, more consistent and much less stressful.